Most dorms have extra long beds, called Twin XL. This means the bed is 80 inches long rather than the standard 75 inches long. So, you’ll need extra long sheets and comforters to fit the oversized twin beds. The width of the bed is the same as a home twin. If you arrive at school and your bed is a twin, don’t despair. Twin XL sheets – if high quality, made with strong, wide, and snug elastic like those at American Made Dorm® - will work with a regular twin. Avoid inexpensive Twin XL mattress pads - especially the kind that are finished with elastic bands. They fall apart after a few washings. Remember that your sheets should last all four years. Go for high quality and you'll be happy. You can buy all your bedding items in a "dorm bundle:, a convenient package containing everything you need for your dorm bedding. 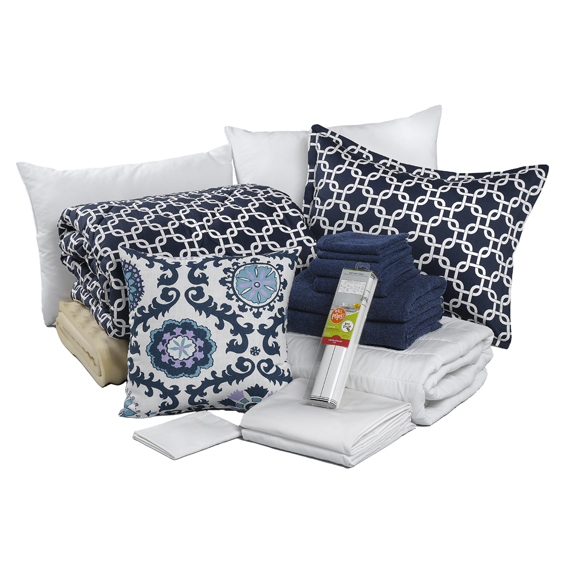 Dorm Bedding “Bundles” are a great option for dorm rooms because they include all the bedding essentials in one package, making back-to-school shopping convenient! Plus, you can SHIP your dorm bundle directly to school and avoid the high airline baggage fees you’d incur when traveling to school with all your bedding. You can also avoid the stress of big box retail store shopping when you arrive at school. Instead, you can begin the process of making your dorm a home the moment you step into your dorm room! Shop American Made Dorm for high quality, made to last, trendy bedding bundles! www.amdorm.com.